Welcome aboard the liveaboard dive boat Ocean Hunter III as you embark on a 7- or 10-day scuba diving adventure to the beautiful island nation of Palau and beyond. You will visit remote reefs that are pristine and virtually undived. In addition to visiting well-known dive sites at the southwest islands of Palau and northern Papua New Guinea, Ocean Hunter III will travel to the Yap Islands and the Northern Mariana Islands—wherever the crew determines the conditions are best for maximizing your dives. Part of the region of Micronesia, Palau is located in the Pacific Ocean, approximately 500 miles (805 km) east of the Philippines. Anguar, Babeldaob, Koror, and Peleliu comprise Palau’s main island group. Palau has been named one of the Seven Underwater Wonders of the World, worthy of preservation and protection. There are few places on earth that can boast the amazing physical offerings, diversity of plant and animal life, and variety of diving opportunities such as those in Palau. Palau’s warm waters offer a rich and biodiverse marine environment that present an amazing variety of scuba diving opportunities. With more than 1,500 species of fish and 700 species of corals, you will see something new and different on every dive. A sampling of the marine life you will encounter includes Black- and White-tipped Sharks, Hammerhead Sharks, and Grey Reef Sharks, Hawksbill, Green, and Leatherback Turtles, Parrotfish and Napoleon Wrasses, Manta Rays, Moray Eels, Eagle Rays, Dolphins, and so much more. Unspoiled and spectacular reefs, caves, sheer walls, blue holes, and Jellyfish Lake teem with aquatic treasures. Adding to the thrill and diversity of your Palau scuba diving adventure are remnants and wrecks from World War II. Above water, the tropical beauty, white sandy beaches, rainforest foliage, waterfalls, and azure lagoons will leave you awestruck. The Yap Islands are part of Micronesia’s Caroline Islands in the western Pacific Ocean. The four main islands that comprise this state are geographically close and joined by a common coral reef. The shores are lined with mangrove swamps and the islands are surrounded by an outer barrier reef that encloses a lagoon. Look for Manta Rays as they hover at their cleaning stations, reefs teeming with all types of fish, including brightly colored Mandarin Fish, and amazingly deep walls that drop off into the depths of the ocean. The Northern Mariana Islands consist of 15 islands in the western Pacific Ocean, between Hawaii and the Philippines. The northern islands are volcanic, some still active. The southern islands are limestone, and present level terraces and fringing coral reefs. Seasonal northeast trade winds moderate the tropical climate of these islands. December to June is the dry season, and from July through November is the rainy season. Scuba diving in this region is excellent. The coral reefs and lagoon here are home to an amazing array of tropical fish. You may experience grottos, wall dives, and wrecks. The marine life in the water includes Eagle Rays, Turtles, and schools of Redfish. 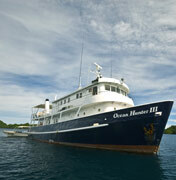 The Ocean Hunter III lets divers enjoy unlimited diving each day, with night dives offered each night. This trip is suitable for scuba divers of all levels of experience. Most dives will be made directly from the boat’s dive deck, but a chaseboat is available to take you to dive sites when sea and weather conditions require. Palau, with its tropical climate, enjoys the same warm weather year round. Water temperatures average 83°F (28°C). A 3mm wetsuit should offer sufficient protection and keep you comfortable. The water in Palau is warm enough for divers to wear a skin or T-shirt. Itineraries from one trip to another may vary as all trips are planned according to sea conditions, currents, tides, and moon cycles. Dive sites are selected so as to ensure you enjoy the best possible scuba diving in Palau and beyond during your time aboard the Ocean Hunter III. During a typical trip, dive sites in the region of Palau you visit may include Big Drop-off Wall, German Channel, Blue Holes, Blue Corner, Turtle Cove, Barnum Wall, Ngedebus wall and coral gardens, Peleliu Wall and Peleliu Coral Garden, Ulong Channel, Siaes Tunnel, Shark City, and many others. The Ocean Hunter fleet strives to provide scuba divers and vacationers with the highest quality and most innovative liveaboard experience possible. In addition to unmatched scuba diving, guests aboard the Ocean Hunter III will enjoy excellent accommodations and delicious meals as part of their vacation package. This dive boat affords guests both safety and comfort as they travel to the best diving locations in Palau.